Imagine if a movie series released ten new installments in ten years, with a secondary stream of shorts and minor spinoffs set in the same universe. Now imagine those movies all take 30 or so hours to complete and cost between $60 and $20. It makes perfect sense if even the biggest Assassin’s Creed fans are still suffering from burnout, even if the series took 2016 off; there have been so many old cities to explore and old men to execute that even I, an admirer of the whole run, feel exhausted just thinking about doing it all again. Here we go, though, with all the assassins and that history. This time it’s ancient Egypt, about 45 years before BC faded into AD, a couple of years before Rome killed its dictator and a decade and a half before Cleopatra welcomed the asp. Our hero is an angry cuss named Bayek, who serves as some kind of all-purpose village problem-solver called the “medjay,” and who starts the game hunting down a secret society of masked yahoos responsible for the death of his son. Spoiler: he wants to do some assassinations to them. Bayek might be the medjay, but that doesn’t mean he can’t also be a bit of a drip. Despite some fine voice-acting from Abubakar Salim, the hero of Assassin’sCreed Origins doesn’t make much of an impression—he’s another Very Serious Videogame Man trying to avenge a murdered family member. When he meets old friends from back home, the ease and comfort that overtakes his nervy demeanor doesn’t register. The most Bayek feels like a real character is when he’s with his wife, Aya, but those are fleeting moments between errands and murders. Bayek is mostly an empty vessel to pour experience points into. He sprints through sprawling maps littered with icons and sidequests, constantly busying himself with some variation on scurrying up walls, killing presumable bad guys, and hanging out in tall grass or hay until those bad guys are close enough for him to yoink them in. Despite some changes to processes and procedures, this is very much an Assassin’s Creed game. And because it’s an Assassin’s Creed, that also means one aspect of the game stands out above the others: its gorgeous, almost overwhelming recreation of a particular place from a particular time long ago. I have no idea how accurate the game’s depiction of first century BCE is, but I know it’s a regularly stunning place to hang out in, especially on a 4K TV. The towns and villages are more sparsely populated than the AD cities from past Creeds, the buildings smaller and more spaced out, but that only makes the grandeur of the most elaborate structures even more powerful. The hot desert sun dances off the temples, obelisks, villas and harbors, dunes and pyramids rest tantalizingly in the distance, and, as always, it’s all there for you to saunter to and climb all over. You’ll regularly coat the pristinely designed floors of those spaces with the blood of thieves, soldiers and Romans, and the combat is one of the most notable departures for Origins. It’s built around the shoulder buttons now, your fingers juggling triggers to whip out a quick strike, a heavy shield-breaking attack, to pull up your shield, or to fire off an arrow. If you’re fighting enemies that are levels above you, you’ll die quickly; in more evenly matched battles you’ll have to dodge and parry to find an opening for your blade. It doesn’t look like much of a change, but it feels different from the fights you might remember from older Creed games, less graceful and less precise. There’s also a heavy loot component, as you’ll find new weapons scattered throughout the world, their stats and perks contingent on common, rare and legendary designations. That sounds like a role-playing game, doesn’t it? That’s the crux of the changes to the Creed formula here: it grafts weightier RPG systems onto the archeological parkour violence you expect. 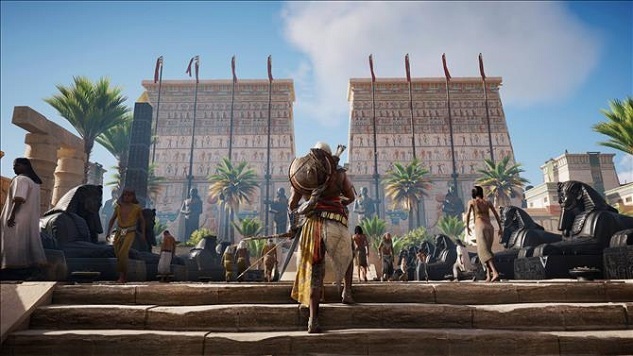 Bayek levels up as he completes missions and kills enemies, earning attribute points that can be cashed in on the requisite skill tree. Everything has a number, from your health and damage capabilities, to the weapons and armor you wear. Crafting can make your tools stronger. Sometimes it feels like cracking open a history book and finding math awkwardly squeezed into the pages. Conceptually those additions make sense, though. Despite their freedom and sprawl, Creed games have always been fairly rigid and straight-forward in how they’re regimented. Those omnipresent icons let you know pretty much everything you need to know, and a symbol (with distance) has always guided you in the direction of your active quest. The collision of scientific clarity and historical vagueness the heart of the series. The increased focus on numbers might break the wall down between the game’s systems and fiction a little too blatantly, but the conflict between having to do things and not wanting to do any of them has always been built into these games. That objective-free hangout mode coming in 2018 can’t get here soon enough. In the end Origins is exhausting in the way all of these games, even the great ones, are. That’s not inherently a bad thing, though. It shows the commitment to world-building that courses throughout the series. Like real life, this game will overwhelm you. The key is to find your own way through it as best as you can, whether it’s beelining straight to the next key milestone or taking the time to wander and discover both your neighbors and yourself. It’s a familiar adventure, but not a forgettable one. Assassin’s Creed Origins was developed by Ubisoft Montreal and published by Ubisoft. Our review is based on the PlayStation 4 version. It is also available for PC and Xbox One.